Surprising journalists at its September 7th press conference, Apple rubbished rumours that they planned to release a cellphone/iPod hybrid when they unveiled the iPod Circular – the latest gadget in the vast range of iPod related products. As a Compact Disc/iPod hybrid, Apple believes that the iPod Circular – the thinnest MP3 player on the commerical market - will revolutionise the way people listen to music, by allowing them to listen to their favourite tracks on CD. As well as being a great MP3 player and data storage device, the new iPod Circular makes a fantastic coaster. 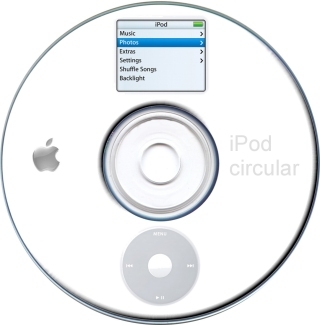 The initial scepticism held by the press after Jobs revealed the Circular meant that most believed the shape was merely a gimmick, however Apple assures us the iPod Circular will be playable in CD drives, as well as via the traditional iPod methods. The iPod circular is only one of many iPod variant products revealed by Apple today. Products also unveiled include the iPod-Army Knife, the EM-iPod (an EMP detonator/iPod hybrid) and the iPod-squared, an iPod-iPod hybrid. Critics have suggested that they can see no practical side of the iPod circular – or any of the other unveiled products - and believed Apple would have been better off investing in larger capacity iPods. Steve Jobs refuted these notions claiming that if the iPod was made much bigger the world would probably run out of music to put on it.